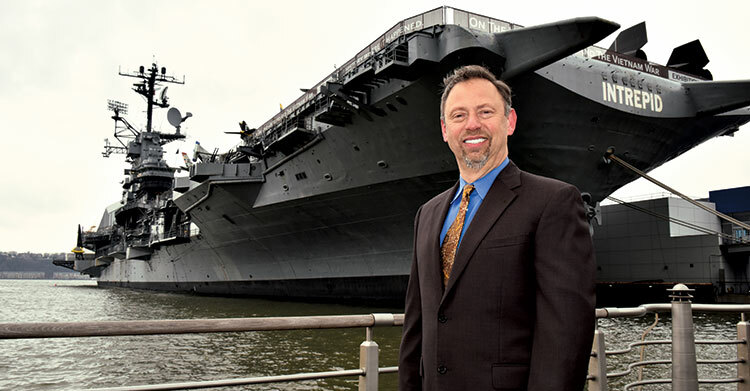 How to land and service accounts like the USS Intrepid, Yankee Stadium and Madison Square Garden. The author stands in front of one of his favorite accounts. As a young man, I was always intrigued when I passed the USS Intrepid. I’m not sure whether it was the enormity of the vessel, or the fact that it appeared indestructible. The battleship was built during World War II for the U.S. Navy and was nicknamed “The Fighting I.” Two Kamikaze suicide planes tried to bring the Intrepid down in 1944 — but failed. The USS Intrepid made its way around the world, serving in locations such as Pearl Harbor, Okinawa and Vietnam. It also served as a recovery vessel for NASA. In 1982, the ship became the Intrepid Sea, Air & Space Museum. In 1996, I happened to notice an invasion of pigeons attacking the iconic battleship. I couldn’t stand by and do nothing, so I summoned my courage and placed a cold call to the museum, requesting to submit a proposal to eliminate their bird problem. Interestingly, the staff granted us the pest management contract first, and added the bird management services shortly thereafter. The main bird issue was pigeons, which is quite common for New York City, particularly for locations along bodies of water. We installed an electrified track system on top of the parapet ledges of the Intrepid’s visitor center. The pigeons were initially flying back and forth from the visitor center to the battleship. Once we installed our bird deterrents, however, they began to relocate completely. BIG-TICKET TIP: ONE THING LEADS TO ANOTHER. One key to our success in bird business is first, obtaining the pest management contract, then proving ourselves so we eventually win the bird management contract. We’ve been very successful in marketing and cross-selling our various add-on services, the main one of which is Bird Doctor. 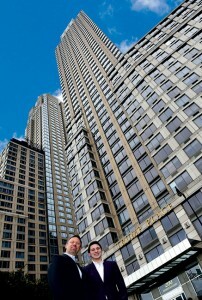 Aust and his son Dan stand in front of another big-ticket account, Trump Place. In 2001, when the New York City Department of Parks and Recreation contacted us on behalf of the Trump Organization for bird netting on new construction under the Henry Hudson Parkway in Manhattan, I knew it would be big. Our Bird Doctor team installed 0.75-in. bird netting on the underside of the highway to prevent pest birds, primarily pigeons and sparrows, from perching over the new basketball and handball courts. We also performed an extensive pigeon guano cleanup, which is typically an important first phase of any large bird deterrent installation. This particular job was a defining moment for our company and me. It dawned on me that this six-figure-revenue job was not an anomaly. There were plenty of large bird-deterrent installation jobs like this one, just waiting to be proposed. I refuse to compromise or cheapen the quality of our work. This becomes an issue of integrity and consistently providing excellent quality service. We always appreciate the investment our clients make to ensure a long-term bird control solution. After the Trump job, the New York City Department of Parks and Recreation called us again to install bird netting underneath portions of the Brooklyn Bridge that correspond to Drumgoole Plaza Public Park. BIG-TICKET TIP: CHARGE WHAT YOU’RE WORTH. While we may propose larger-scale projects on a regular basis, we only accept the jobs whose objectives align with ours. Our clients expect excellent quality service — and not necessarily at the lowest price. Although profitability is crucial for the health and stability of any organization, ensuring we provide service that exceeds our clients’ expectations often requires charging more than those who might undercut their prices to win bids. Having Yankee Stadium as an account has led to more bird work around the country for Aust and his team. Bug Doctor and Bird Doctor have been providing services to Yankee Stadium since 2001. 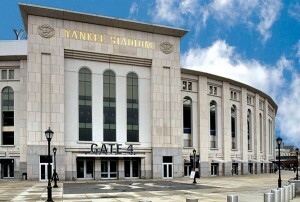 At one point, we were servicing both the old and new Yankee Stadiums simultaneously. We initially installed more than 25 miles of bird spike, tens of thousands of feet of electrified track, and 0.75-in. bird netting to the entire loading dock. There wasn’t a bird issue at the new stadium, so this was all preventive work. Currently, we provide an ongoing maintenance program to ensure a bird-free environment. When I go to Yankee games, I notice pigeons on many neighboring buildings in the Bronx. We take a lot of pride in working at Yankee Stadium and I personally feel it’s my duty to keep birds off and out of it. BIG-TICKET TIP: WORD GETS AROUND. The success we’ve had at the Yankee Stadium account has directly led to work at more than 15 other sports venues around the United States. Four years ago, we proposed Gillette Stadium for the New England Patriots and when we were awarded the bird work, my son Nick asked, “How are we going to hate the Patriots anymore?” It’s interesting how once someone becomes your client, all rivalry melts away. Dan and Stuart Aust take pride in the fact that no bird deterrents are readily visible on their Madison Square Garden account. 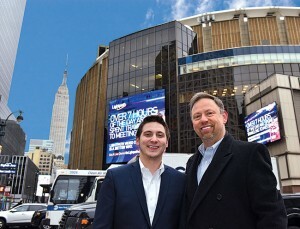 For more than a decade, Bird Doctor has had the privilege of servicing Madison Square Garden for bird control. It’s known as the “World’s Most Famous Arena,” mostly because it has been the site of some of the greatest events ever in the history of sports and entertainment. Our job has been to keep pest birds such as pigeons and sparrows off of various parts of the building by using a combination of deterrents such as bird netting, bird spikes and an electrified track system. We installed an electrified system years ago on the signage. It sits just 0.25-in. high on top of the signage, undetectable from the sidewalk or street below. Because these areas are busy with pedestrian traffic during the day, we provided the install at night, after all events were over. We also installed bird netting at some of the service entranceways, and bird spikes on top of horizontal flag holders at a breezeway that leads into The Garden. BIG-TICKET TIP: THE BEST WORK IS INVISIBLE. High-profile accounts tend to gravitate to the aesthetically pleasing materials that have low or no visibility from a distance. Many times, when a TV announcer is speaking before a game or at halftime, the camera pans to one of the entranceways that has the Madison Square Garden signage. I’m always relieved when I see there aren’t any pigeons sitting on the signs. Another large bird deterrent installation job came from a phone call we received from a project manager at Jones Lang LaSalle, a professional services and investment management firm. When I first reviewed the architectural plans, I had no idea to whom the building belonged. Later, I learned the owners of this historic New York City-designated landmark building are Sheikh Hamad bin Khalifa Al-Thani and Sheikha Mozah — the king and queen of Qatar. This is the largest single-family residence in all of New York City. Bird Doctor was asked to provide shop and CAD drawings to the owners’ structural engineering firm, Thornton Tomasetti. The product that was specified was an electrified track system to prevent pigeons from roosting and nesting on this beautiful building. We hired an architect to assist us with this phase of the project. We installed more than 10,000 linear ft. of electrified track on the front and rear of the building. A 135-ft. articulating lift gave us access to the front of the building. A bosun’s chair allowed us to reach all the ledges and access the rear courtyard. We obtained permits from the U.S. Department of Transportation to secure a lane closure for the lift. Upon the client’s request, we installed a small mockup of our product prior to the full installation, ensuring the product was aesthetically pleasing. We performed the mockup and then performed the full install. We now provide ongoing annual maintenance of the electrified track system at this building. We learned several new takeaways from this project. We can now provide shop and CAD drawings for our future clients. Mostly, I learned not to be afraid when encountering something unfamiliar. Once this project was completed, the Jones Lang LaSalle project manager invited me to come to Doha, Qatar, to inspect two of the king and queen’s palaces that were having pigeon issues. How could I say no? BIG-TICKET TIP: TAKE THE LONG VIEW. It’s always important to offer a maintenance plan on installed bird deterrent products, as issues can occur. Sometimes material or connections come loose; other contractors may damage the systems; debris or bird defecation can short out the connection; and weather or other acts of nature can damage products. Don’t be a “one-and-done” type of company. Instead, look forward to a long and healthy business relationship. Make no mistake, not everyone can bring in these big-ticket bird jobs. You have to be willing to hit the pavement and put in the time and work. You need the drive, desire and ability to persevere. My dad, Herb Aust, always said to me, “You go where other men in your industry don’t go, and that’s why you’re a success.” I’ve certainly made my mistakes, and I’ve had my fair share of failures in business. But walking through these very mistakes, failures and uncertainties has taught me invaluable lessons. 1. Perform an on-site assessment. Whether it’s a referral, an existing account or a cold call, we generally make an appointment to meet with the facilities director or appropriate personnel for assessing the issue. If it’s an exterior problem, measurements are taken (or if pre-construction site, architectural plans and drawings are used) and bird deterrent options are discussed. If it’s an interior problem, different options are offered. Additional costs can include state licensures, Transportation Worker Identification Credential (TWIC), Secure Worker Access Consortium (SWAC) lift certification, U.S. Occupational Safety and Health Administration (OSHA) compliance, scaffold certification, insurance, permits, specialty tools and accessibility. Your desired projected profitability is added to the final cost of the job. 3. Present the proposal, ensuring that all decision makers are invited to attend. When presenting a big-ticket bird proposal, our Bird Doctor house rule states that any proposal valued in excess of $10,000 is to be proposed in person. We prepare and give a proposal presentation for everyone in attendance, and use a digital format to present each phase. A typical presentation for a big bird job may take about an hour. These in-person proposals often require product samples, a list of references, photos of previous comparable jobs, and marketing material.The client’s budgetary restraints often drive the products or methods chosen to control birds (see “The phase approach,” below.). We review our measurements and our recommendations for various areas of the structure. Often, multiple methodologies are recommended for different areas. Along with explaining the varying types of methodologies, apprising them of the dangers, structural damage and health risks associated with bird infestations are valuable conversations that also need to take place. 4. Once awarded the contract, make sure you’re aware of any pertinent local laws. Every state and district has its own permitting and fees associated with it. For example, large cities like New York have an embargo during the holiday season, where you cannot obtain permits from the Department of Transportation for lifts to be used on the street from Thanksgiving until January each year. 5. Let your insurance provider know of your project. Last but not least, your commercial liability carrier should be apprised of the type of work being performed, and the type of access equipment used to install bird deterrents. Tim Periard, Bird Doctor’s VP of operations, uses adhesive to secure an electrified track. fits into their financial budgets. Stuart Aust is the CEO and president of Bird Doctor Worldwide and Bug Doctor Nationwide. He can be reached at 201-599-1007 or stuart@birddoctorinc.com. 1 Comment on "Big-Ticket Bird Jobs: How to Land High-Profile Accounts"